The Mauritius Post is issuing a Special Commemorative Cover to commemorate the birth centenary of Hon. Seewa Bappoo. Mr. Bappoo was born on November 10, 1911 in Vacoas, the eldest of 8 children to Mr. and Mrs. Ramchandar Bappoo. His grandparents were both from Ratnagiri, in Maharashtra, India. He was educated at the Church of England School in Phoenix and at the Curepipe Boys' School, and then completed his secondary education at the Royal College of Curepipe. Mr. Bappoo was a keen philatelist and a lover of nature, mostly of the sea world. He was also passionate about roses, especially blue ones. From November 1963 to November 1976 he was a Member of the Legislative Assembly, and from 1974 to 1976 was appointed Parliamentary Secretary until he retired from politics. In 1965, Bappoo attended the London Constitutional Conference at Lancaster House, which paved the way for independent Mauritius. In his maiden speech in December 1963, he said "that independence will come as a natural step in the development of any upsurge country. To get our independence we must show ourselves up to standard, as we are far from facts that everyday proved our political maturity. We must be determined to goive every citizen his freedom and employment, by helping the enlargement of various industries, helping the creation of new ones, facilitating the industrial, agricultural and economic development of Mauritius and eventually a real industrialisation of Mauritius. We sincerely hope that we will help towards the progress and prosperity of this country, the pearl of the Indian Ocean." In 1981, he was awarded the Order of the British Empire (OBE) by the Queen Elizabeth II for his cultural involvement in the Marathi community in Mauritius and his political contributions from 1963 to 1976. 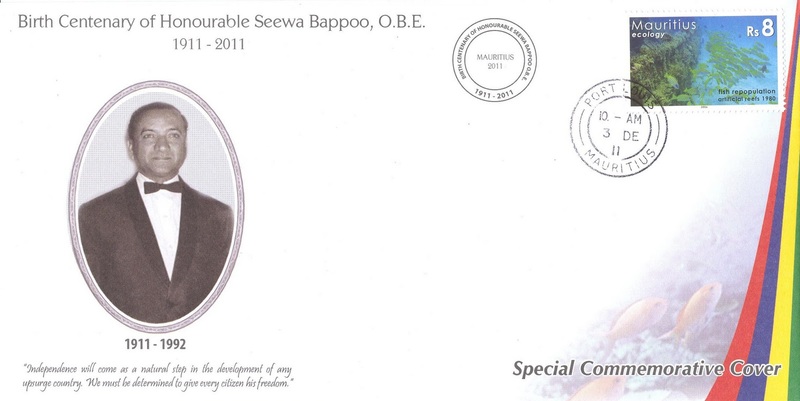 The late Honourable Seewa Bappoo passed away on March 3, 1992 at the age of 80. Event: Birth Centenary of Honourable Seewa Bappoo, O.B.E.